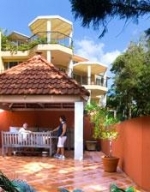 Parkshores Sunshine offers unsurpassed quality self-contained 2 and 3 bedroom accommodation in a lovely lush tropical setting. A private and exclusive external entertainment area has been developed around the native flora. Adjacent to the sparkling aqua pool is the barbeque set alongside stainless steel benches with a large table, well shaded by a high pitched gazebo. Parkshores - Sunshine is an easy 100 metre stroll down the path to Sunshine Beach with an array of boutique shops, restaurants the Sunshine Beach Life Saving Club.